Darren here from the lovely Wigs.org team :smile: I hope you are all good! I'd love to hear everyone's comments and suggestions on how we can improve either of our websites for you. Would love to hear what you like or dislike, so I can feed your comments back to our wonderful team. We are always looking at ways to improve our service and offering and would sincerely welcome your feedback. You can either leave a message here or if you would prefer to email me directly, you can email forumatwigsdotcom. I am frustrated with the lack of real color displays with descriptions of the colors. Deciphering the number codes or viewing the tiny little boxes that denote the colors, UGG! Color swatches are not enough to give a good clear understanding of the colors either. It takes a lot of time to compare colors from one wig make to the other. Generally speaking for me it results in numerous returns an exchanges. And I hate being dubbed a "serial" customer. Just sayi' there needs to be a better and more effective way to insure a win-win situation. Hear Hear!!!!!!!! Actually - I would like to see 70 year olds in styles that can be worn at 70 but perhaps would not be thought of as a style for that person. Perhaps not just wrinkles but also a bit of sagging skin - so we can relate to how that wig will look on us. Regarding color - as we have had discussions the last few days - the color is always unpredictable. I am struggling with whether to order another wig in a color that looked great on one wig - and on the same wig a month later is a dull color that I hate. So, you can never really tell the blend until you get it - that is my conclusion. ..........would love to see older wig models as well. Color is always a chore too. I will be sure to pass this on to my team. Allow a side by side comparison of wigs. The Wig Company does this on their website. Allow a search by weight or density, and by color. What about a 360 degree view? There is a wig site that has a picture of the actual wig (not on a model), that does a 360 degree view where it turns around. Have pictures of the wigs in outdoor light, so we can actually see the hair color we are getting. It's the color for me too, when choosing a new wig. I've often wished you had a picture of the same model wearing every different color of that wig available. I think I'd be able to choose more easily that way. Thanks for asking for our input. I agree. Colours are the most difficult part to figure out. I found a colour I like of RW’s but if I ever decided to switch, it would be a difficult. It would be good if you could compare all the blondes (just to pick a colour, for example sake) of all the various brands and see how they compare one to the other . I am a fan of the videos that describe the style and also show what it looks like all the way around. A good description in the video (for example, layers or no layers) is helpful too. I'd like to see more products, reviews, and generally more support for guys who wear wigs. Wigs.com has the best site! Color comparisons would be wonderful. If I wear Welch's RL19/23ss, but want to try a Renau, which of his colors most closely matches Shaded Biscuit? A comparison chart? Or, I could type in the Search box my color; Welch wigs in that color appear first, but then other brands that closely match could appear below Welch (with a subtitle like, "Other Brands Similar To Your Color Preference." Color keeps me from trying new brands. I agree with everyone else. I would like to add that being able to put wigs that I like into a wish list for later would be enormously helpful! Yes, definitely a “wish list”. I sometimes forget names or colors between sales. I absolutely agree with all the suggestions. Great feedback wig community! We are carefully considering all suggestions and we truly appreciate your responses! I just ordered and received 2 HEAT by JR wigs in 12fs8. As has been noted here in the forum and elsewhere - the colors on these wigs vary (sometimes significantly) based on dye lot. So - this time - I was clear when ordering that I wanted 2 wigs from the same dye lot (same run). Well - they are NOT from the same dye lot. And once again, the colors of the 2 wigs are quite different. So - I am hesitant to continue ordering from wigs.com . Since both wigs are purchased at the same time - it is clear to me that you should be able to get the same dye lot - and frankly, I would rather wait for the next run rather than get 2 different color lots. I used to order elsewhere and they would get me the same dye lot - so I really will need some assurance going forward or I will order elsewhere. I am also going to post this issue in the general chat because I know others have the same issue. Hope something can be done to address this issue. One of my wigs is hardly rooted at all - and the other is. A real issue since I tend to rotate wigs. Thank you for your response and reaching out about your concerns about the dye lot issue and we are going to speak to the manufacturer regarding this. We will also keep you updated on this as we go along! Your input is valuable to us and we thank you for being an active member on the forum! This is a great suggestion, we will certainly discuss this here at Wigs.com! Great suggestions! We have some new happenings going on here at Wigs.com that go right along with your suggestions so stay tuned! We understand that colors can be tricky and appreciate your feedback! All of the suggestion on this thread are being considered and discussed amongst us here at Wigs.com . As far as being a serial customer goes, no need to worry about that! We love having you as a client and it's our passion to help you find the perfect look! Thank you for expressing your concern regarding the Jon Renau color variance. We have reached out to Jon Renau directly, and they have explained that they do not manufacture their product with color/dye lot numbers, only with style lot numbers. The reason for this is to ensure each style that arrives maintains quality standards to the construction and silhouette of each piece. They also explained that each item is handmade by a skilled artisan, due to this the product may have some variances in comparison to one another with regards to color, curl pattern, hand-knotting, etc. . Please don’t hesitate to reach out to us directly with any further comments or concerns! i just uploaded the tags from my recent purchase. Notice that in addition to the style number - there is a second number on the left side of the tag. I believe this number represents the run number. When i used to order elsewhere - the person fulfilling the order said it was dye lot and they were careful to send from the same lot. There was never a color difference. In this past shipment - even my husband can tell the difference between the colors and believe me - that means it is noticeable. Interesting that JR says they dont have dye lots. What do they say this second number refers to? 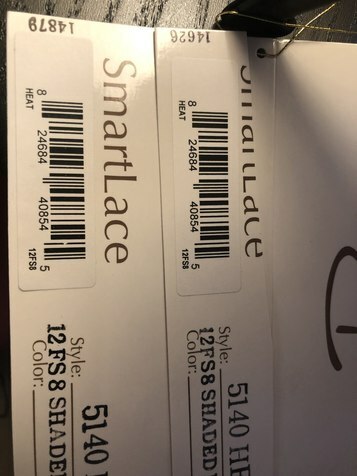 Even if they are style lot numbers - my guess is they work from the same blended hair - so basically dye lots. Can i in the future get the same style lots? Jon Renau would love to talk further with you about this. Could you send us a private message with your preferred contact method please, either email, phone or whatever you prefer and we'll connect you. Thanks for being a part of this wonderful community! gosh- that is great that they are willing to do that. I love their wigs in general. I will pm - but basically i will be happy if those lot numbers match on future multiple purchases at the same time.